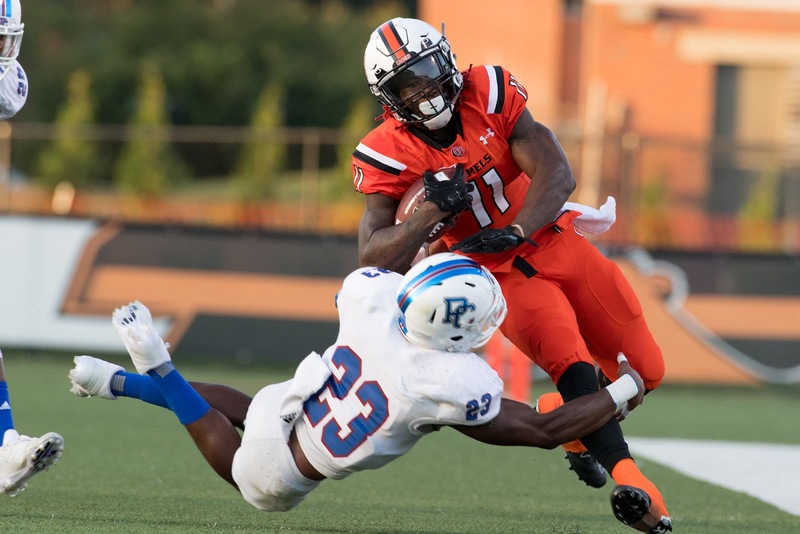 BUIES CREEK – Presbyterian hands Campbell their first loss of the season 31-14 in front of the sixth largest home crowd in Barker-Lane Stadium history. Campbell’s do-it-all QB Elijah Burress led the Camels with 161 yards of offense, 117 yards through the air on 10 of 23 passing with one touchdown and 44 yards on the ground on 15 attempts. Presbyterian was led by RB Darrell Bridges, who carved up the Campbell defense for a season high 159 yards on 32 carries for 1 TD. QB Will Brock, making his first start for the Blue Hose, completed 11 of 21 passes for 129 yards with two touchdowns. He’s first finding Cedric Frazier in the back of the end zone from 21 yards out, giving Presbyterian the early 7-0 lead. Presbyterian would add a Brett Norton 26-yd field goal before the end of the 1st quarter and a Bridges six-yard touchdown on the QB keeper early in the 2nd quarter to take a 17-0 led before the Campbell offense would awaken. After a quarter and a half of three-and-outs, Campbell’s offense comes to life in a five play, 73-yard drive that ended in a 28-yard touchdown pass from Burress to Jared Joyner. Mitchell Brown’s PAT kick was no good, leaving the score at 17-6. Presbyterian would answer back with a touchdown drive of their own before the end of the first half to take a 24-6 lead into the locker room. After a defensive showdown in the third quarter, Campbell tried to make it interesting to start the fourth quarter when DeShawn Jones found the end zone and the ensuing two-point conversion pass from Burress to Austin Fleming cut the Blue Hose lead to ten, 24-14. Presbyterian would put the game out of reach a couple drives later when Brock would find Darquez Watson for the 17-yard Blue Hose touchdown with 2:27 left to play. Presbyterian’s offense outgained Campbell’s 348-258. Up next for Presbyterian is their home opener against a streaking 3-0 Florida Tech team.